We are pleased to share an update about the new Cardiology module in ClinicalConnect. Click here for additional details. 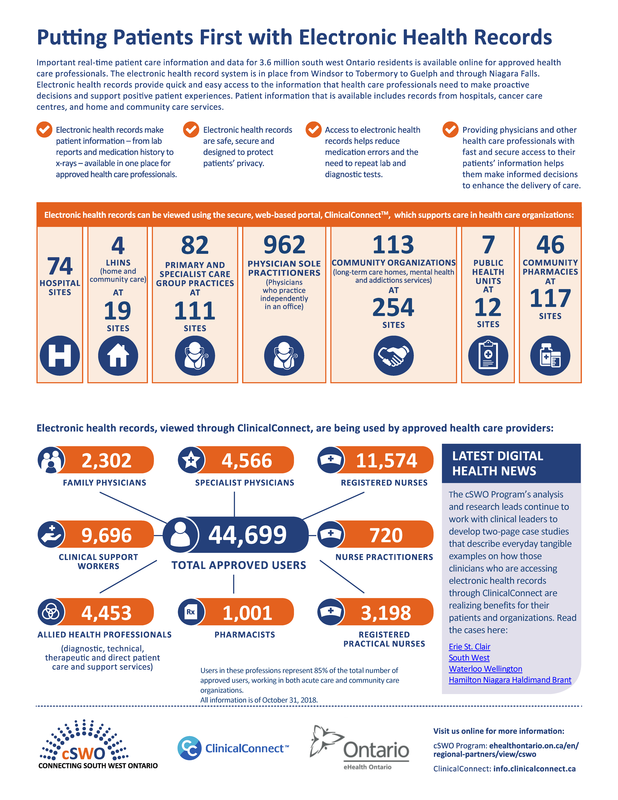 Please click here to view the accomplishments for ClinicalConnect in 2018. It’s been just over a year since ClinicalConnect underwent a major upgrade. The HITS eHealth Office at Hamilton Health Sciences, responsible for operating ClinicalConnect, wanted to highlight all that’s been done to respond to feedback and continuously improve the system’s performance for end users. Click here to read the complete announcement. Following the initial integration of ClinicalConnect with eHealth Ontario’s Primary Care Clinical Data Repository (pcCDR) on December 2, 2017, we are pleased to announce that in addition to the sub-set of data already contributed by McMaster Family Health Team (FHT), a sub-set of data from three additional FHTs is now also available to authorized users of the Primary Care module in ClinicalConnect. In an effort to keep the ClinicalConnect community aware of work to improve your user experience, part of that work has revealed that Google Chrome, Microsoft Edge, MacOS Safari or Mozilla Firefox will all yield better performance (i.e. speed) over any version of Internet Explorer (IE), and Google Chrome is currently recognized to yield the best performance. The overall browser performance improves with every new version of Chrome (or alternate browser as listed above), while Microsoft is no longer further developing its IE11 and its performance is frozen at 2013 levels. Microsoft IE has been superseded by Edge. We do recognize that certain healthcare organizations may be restricted to the use of IE. Work is ongoing to identify ways to improve the performance for users who are limited to using IE to access ClinicalConnect. “Connect” Business Acquired by Aptean Corp. Please be advised it’s just been announced that Aptean Corp. has acquired the ‘Connect’ division of Influence Health. Influence Health is the vendor of Connect, the platform on which ClinicalConnect™, the regional clinical viewer for south west Ontario, is built. Click here to read the complete announcement. We are pleased to announce the successful integration of ClinicalConnect with St. Joseph's Healthcare Hamilton's new hospital information system, Epic, as well as eHealth Ontario's Primary Care Clinical Data Repository. Click here to read complete announcement. Click here to read about the new version of ClinicalConnect and its enhanced features and functionality. Click here to read more about the "Under Authority Of" (UAO) selector for users authorized by multiple organizations to access ClinicalConnect. Mark Farrow, VP of HITS & CIO, Hamilton Health Sciences, recently was interviewed by healthsystemCIO.com and spoke about leveraging data to improve population health and how ClinicalConnect makes a difference in Southwestern Ontario. Click here to read the article. Click here to view the December eUpdate. Click here to read about updates pertaining to HOBIC data as well as a Days Back filter update applied in ClinicalConnect, effective February 25, 2016. Click here to read ClinicalConnect Portal: Improving Patient Care & Efficiency, published in Volume 15, Issue 4, 2015 in Health Management: The Journal. Read Integrated Electronic Records Connect Healthcare Providers, The Windsor Star, August 5, 2015. Data from all 67 acute care hospital sites in South West Ontario is now accessible in the cSWO Regional Clinical Viewer, ClinicalConnect, following the successful integration of the remaining six hospital sites in the Erie St. Clair Local Health Integration Network. Click here to read more. The addition of diagnostic images from these hospitals complements those already available in ClinicalConnect for Hamilton Health Sciences, Norfolk General Hospital and St. Mary’s General Hospital. Click here to read the full release. click here to read more about the changes to CCAC client health information available in ClinicalConnect. Click here to read the full integration announcement. ClinicalConnect User Forum now available! We are pleased to announce that lab requests and results from eHealth Ontario’s Ontario Laboratories Information System (OLIS) have successfully been integrated into ClinicalConnect, a secure web-based clinical viewer. Click here to read more. We are pleased to announce that hospital data from Bluewater Health has now been integrated into the ClinicalConnect portal. This marks the first completed integration in Erie St. Clair (ESC) Local Health Integration Network (LHIN) as part of the connecting South West Ontario (cSWO) Program. Click here to read more. We are pleased to announce significant updates to ClinicalConnect, a secure web portal that provides authorized physicians and clinicians with a single point of access to an expanding data set for patients in south west Ontario.